More often than not, we tend to shrug off shoulder pain and stiffness by popping a painkiller. But, it is important to be aware that a frozen shoulder can gradually advance to make it impossible for you to carry on with your routine tasks. Therefore, it is important to take any shoulder discomfort seriously in the budding stage, to prevent major problems later on. Repeated self-medication for a minor shoulder pain can ultimately make you land at a point that is something more serious, such as a frozen shoulder. Frozen Shoulder is a chronic painful stiffness of the shoulder joint. Generally, it involves pain and stiffness that develops gradually, gets worse and sensitive. Frozen shoulder is sometimes mistaken for arthritis, but, these two conditions are unrelated. While frozen shoulder involves specifically the shoulder joint and surrounding tissue, arthritis refers to multiple joints. A Frozen shoulder can occur in any one shoulder or both. Frozen shoulder usually develops in three stages, with each stage lasting several months. In the initial state, any movement of your shoulder could cause pain, with the movement of your shoulder getting limited. As it advances, the pain may begin to diminish, but your shoulder gets stiffer and it becomes increasingly difficult to use it. Even when the pain subsides, the stiffness could be disabling. This condition may stop you from reaching over your head to the side, or across your chest and from rotating your arm all the way, making it impossible for you to scratch your back etc. Finally, in its final stages, the range of motion in your shoulder may begin to improve, but, you may experience worsening pain at night, disrupting sleep patterns. Frozen shoulder can occur to anyone, but commonly affects people in the age group 40 to 60 years, and is more likely in women than in men. 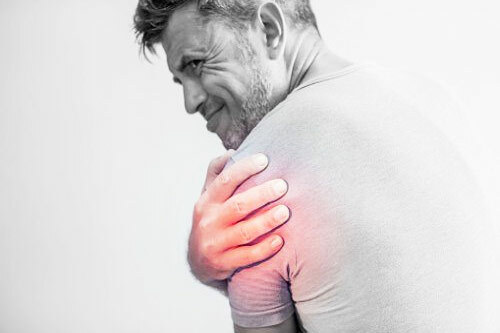 A frozen shoulder occurs when the connective tissue capsule around the joint thickens, restricting its movement. It can occur following an injury or a surgery, stroke, in people with diabetes, heart disease, thyroid issues or lung disease. In Ayurveda, it is believed to be caused due to aggravation of vata dosha and a vata and kapha imbalance. According to health experts, there are possibilities that frozen shoulder may seriously interfere with a person’s ability to perform daily tasks such as bathing or dressing. Doctors, therefore, say that pain and stiffness in the shoulder should never be ignored. It may take anywhere between one year to three years to recover from the condition, depending upon its severity. In Ayurveda, frozen shoulder is referred to as ‘Apabahuka’. Ayurvedic doctors suggest several approaches to successfully treat a frozen shoulder. Ayurveda, being a personalized health science, the treatment for each case of frozen shoulder may be different. It is important to identify the root cause, and based on that, treatment is recommended which would be a combination of herbal concoctions, churnas, guggulu preparations and herbo-mineral rasa medicines that help pacify the aggravated vata dosha, which is believed to be the primary reason behind this condition. ‘Panchakarma Therapy’ is also believed to play a vital role in treating this condition, as it helps unlock the restricted movement of the shoulder through medicated lubrication and fomentation. The herbal enemas used in this procedure helps in bringing back the vata dosa to a balanced state. Ayurveda has several effective internal medications and external treatments for frozen shoulder. However, it should be administered only after meeting a qualified Ayurvedic physician, as he will be able to prescribe the right therapies based on your particular body type and condition. Warm coconut oil or sesame oil with camphor and apply on affected area for pain relief, followed by warm compress. Although the result is slow-paced, it would be effective. Add 3 to 4 crushed garlic cloves in half a glass of boiled milk, or consume a teaspoon of sesame oil with warm water every morning. Add Epsom salt to warm water and use it for fomentation to relax shoulder muscles. If your condition is caused due to increased blood sugar level, herbs such as ‘Haridra’ and ‘Amalaki’ powder may be helpful in controlling the sugar levels. Turmeric and Alfalfa may help in relieving inflammation and repairing the shoulder tissue. Some specific Ayurvedic medicines such as ‘Varunadhi Kwatha’ decoction (30ml twice a day before food), ‘Simhanada Guggula (1 tablet twice a day after food) and ‘Lasunadi Rasayana’, may be suggested for effective pain relief, depending on your individual condition. Avoid use of any form of stimulant such as tea, coffee or alcohol. Avoid frozen food, fast food, carbonated drinks, stale food, white flour and packaged food. Avoid heavy exercises, heavy weight lifting, untimely sleep-wake hours and exposure to cold environments for too long. Do not skip meals. Eat only fresh lukewarm foods. Drinking a powdered mixture of dried ginger, fenugreek and carom seeds, by mixing it in lukewarm water after meals is effective in offering relief. Include Ashwagandha as a supplement, as it provides effective relief. Massage the affected area with lukewarm oil twice a day. Use ice pack on the shoulder 15 minutes at a time several times a day, as it helps decrease the pain. Finally, remember, the onset of most diseases are due to faulty diet and lifestyles. Therefore, it is essential to maintain a healthy mind and body by eating nutritious food, sleeping on time, avoiding sedentary lifestyle and exercising.